1824 January 2 Paul Trapier Gervais Jr. was born in either Charleston or on Johns Island. His parents were Rev. Paul Trapier Gervais (1785-1856) and his third wife, Sarah Dewar Wainwright (1789-1826). The child had five half-siblings, who were the children of Rev. Gervais’ first wife, Martha Perry Jenkins (1787-1817): Mary Margaret, John Lewis, Martha Powell, Margaret Jenkins, and Claudia. Rev. Gervais’ second wife, Claudia G. Thayer (1798-1820) died without having children. 1826 Rev. Gervais and Sarah Wainwright Gervais had a second child, Sarah Ann (1826-1867). The mother died in childbirth. 1830 According to the U.S. Census, Rev. Gervais was living on John’s Island with several children and a woman between the ages of 30 and 40, which could mean that Gervais remarried as early as 1830 (U.S. Census, 1830). His fourth wife, Harriet Loundes Thayer, was born in 1796, and the couple had no additional children. She may have been related to Gervais’ second wife, Claudia G. Thayer. 1854 November 14 Thirty-year-old Paul Gervais married Jane Caroline Lance, daughter of William Lance and Marie Fraser Lance. The couple had nine children: Mary Wainwright (1855-1944), Paul Trapier (1857-1894), Wainwright Bacot (1859-1948), twins Lucian Charles (1860-1862) and John Lewis (1860-1861), William Lance (1862-1865), Thomas Fraser (1864-1865), and twins Lucian Lance (1870-1947) and John Lewis (1870-1871). 1856 March 16. Harriett Loundes Gervais died at age sixty at the family home Laurels on John’s Island. 1856 July 28. At the age of seventy-one, Rev. Gervais died at St. John’s and was buried in St. Philip’s Cemetery, Charleston. His extensive property holdings were distributed among his surviving children and grandchildren. Paul Gervais Jr. was thirty-two years old. He inherited Exchange plantation on Johns Island. 1861 Nov. 10 At age thirty-seven Paul Gervais enlisted in J.B.L. Walpole’s Company (the Stono Scouts) of the South Carolina Militia. I have found little on this unit but am pretty sure was not a CSA unit. They entered service in Nov. 1861 to provide pickets and videttes for the SC coast between the North Edisto and Stono Rivers, and served in that role for most of the war. It was stationed on Johns Island. They were included in Robertson’s Brigade, in Major General Ambrose R. Wright’s Division, as reported January 20, 1865. The brigade consisted of Artillery units and SC Senior and Junior Reserve units, surrendered at Greensboro, NC on 26 April 1865 [Register, Jeannie, Customer Serive. Civil War Soldiers Records. Wilmington, NC: Barefoot Publishing Co., 2013]. 1865 April 28 Paul T. Gervais’ name appeared as a first lieutenant on the “Muster Roll of Officers and Men paroled in accordance with the terms of a Military Convention entered into on the 26th day of April, 1865, between General Joseph E. Johnston, Commanding Confederate Army, and Major General W.T. Sherman, Commanding United States Army in North Carolina. Roll dated Trinity College, April 28, 1865. Paroled at Greensboro, N.C., May 1, 1865” [Civil War Soldiers Records]. Gervais was forty-one years old. The family report is that he burned his own home at Exchange plantation to prevent its falling into enemy hands. 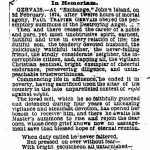 1874 February 2 Paul T. Gervais Jr. died at age fifty, leaving his forty-seven-year-old widow, Jane Lance Gervais and four living children: Mary Wainwright, Paul Trapier, Wainwright Bacot, and Lucian Lance. 1880 By 1880 Jane Lance Gervais and her youngest child, Lucian Lance, had moved to Kenosha, Wisconsin. Kemper Hall, a preparatory school for girls, had been founded there in 1871 by local Episcopalians. As a widow, she was probably attracted to Kenosha because the Episcopalian Sisters of St. Mary were taking over Kemper Hall that year. Perhaps she went there to teach, have housing, and find schooling for her youngest boy. 1892 May 16 Jane Lance Gervais died in Kenosha, Wisconsin.